Nuts and seeds such as almonds, walnuts, pistachios, pecans, pumpkin seeds, sunflower seeds, and peanuts all contain a host of healthful nutrients. Just a handful packs a powerful punch of vitamins, minerals and fats, all of which work together to affect your heart, your brain and your waistline. Just 1 ounce a day can diminish inflammation and provide satiating fiber, protein and immune-boosting minerals. Nuts and seeds contain healthful mono- and polyunsaturated fats. These fats are essential to health by managing inflammation and maintaining the normal structure of every cell in our bodies. Saturated and trans fats, found in meats, full-fat dairy, fried and processed foods can be damaging to our bodies by triggering inflammation. Research shows that diets high in these unhealthy fats can lead to a host of diseases. Choosing healthy fats instead can lower cholesterol and decrease inflammation. A study published by "British Medical Journal" in 1998 found that individuals who consumed nuts five times a week had a 35% reduction in heart disease risk. Fiber helps to slow digestion, which helps you feel full longer. This translates into eating less, which over time can lead to weight loss. The role of fiber does not stop there. Fiber intake from fruits, vegetables, whole grains and nuts helps to decrease cholesterol. There are various mechanisms by which this occurs. First, fiber binds to bile acids, which are needed to digest fat. This process not only decreases fat absorption, but also leads to cholesterol being used to replace bile acids excreted when bound to fiber. Secondly, the fermentation process of fiber that occurs in the intestines causes a short-chain fatty acid called propionate to form. Propionate acts in the liver to prevent the enzyme HMG CoA reductase from triggering production of cholesterol. The "American Journal of Clinical Nutrition" published research that found an additional 25 percent reduction in cholesterol levels after nut consumption that could not be explained from the composition of healthy fat alone. Researchers speculated that fiber and mineral content in nuts were responsible. A plant-based diet is currently being recommended by the American Cancer Association for the prevention of cardiovascular disease and cancer. This diet includes some lean protein, such as poultry or fish, and is high in fruits, vegetables, legumes and whole grains. It limits red meats, processed meats and refined foods. A study published by "Circulation" in 2008 that followed over 72,000 women for 28 years found that those women who chose a plant-based diet had a greater than 25 percent decrease in both heart disease and cancer risk. An ounce of nuts provides 6 g of protein on average. Nuts and seeds contain minerals such as magnesium, zinc, calcium and phosphorus needed for bone development, immunity and energy production. The Nurses’ Health Study found that subjects who consumed the highest amount of magnesium, about 350 milligrams per day, had significantly less inflammation than those with the lowest intake. Inflammation is related to nearly every disease and has direct links to heart disease and type II diabetes. 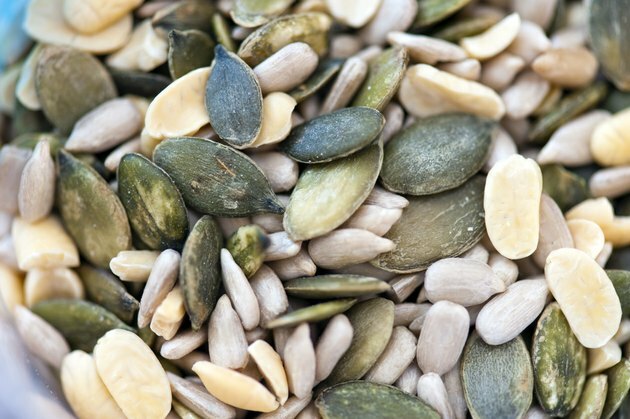 One ounce of sunflower seed kernels contain 100 mg of magnesium. Calcium is a mineral needed for bone development, but it is also needed to send signals to cells and produce energy. One ounce of almonds provides 75 milligrams of calcium. A handful of nuts, or about 1 ounce, is a serving. Aim to consume a variety of nuts and seeds, as they all contain different vitamins, minerals and ratios of healthy fats. This will not only give your taste buds some variety but also ensure that your body is getting adequate amounts of all the different nutrients nuts have to offer. Opt for nuts or seeds in their most natural state, without added oils or salt. So next time you crave something crunchy, skip the potato chips and indulge that craving guilt-free by grabbing some nuts or seeds.